We are the skip hire professionals and we have a bin for every occasion. Whether you are undergoing a major renovation or just doing some spring cleaning, we have a skip bin & mini skip hire service that can manage your waste removal. We hire skip bins in all shapes and sizes from our 2 metre mini bins through to our 8 metre bins. Hire a skip bin for a timeframe that suits you, a day, a week or a month, the decision is up to you. How Does Hiring a Skip Work? Simply call us on 131 546 or “book a free quote” and we’ll give you a quote within 10 minutes, then deliver a skip bin to your doorstep. Once you have filled up the bin, one of our friendly professionals will pick the bin up and take care of the waste. It couldn’t be simpler, no worries and no fuss. Skip bins makes waste management quite easy for everyone. It can be light and mixed waste or heavy waste, spring cleaning or construction and demolition waste. The skip bins are available for hiring for the management of these all kind of occasions. Our professionals are there to help you effectively in delivering the skips and to move away the loaded skip bins for you. All you have to do is contact one of skip bin hire service provider and book a bin. Contact us through the phone or online and hire a proper size of skip bin that suit your occasion, which might be domestic waste disposal, heavy and hazardous waste disposal, or demolition and construction waste disposal. One of the reasons Jim’s Skip Bins are so successful is our ability to offer skip bins in a wide variety of sizes. After all, no one size fits all and that’s also true when it comes to skip bin hire. We literally have a bin for every occasion, whether you simply want to dispose of rubbish from your latest garage clear-out or you’ve embarked on a major house renovation project. Whether you’re a private resident or a commercial business, when it comes to skip bin rental, you can trust Jim’s Skip Bins to provide the perfect sized skip bin for your needs. Take a look at our rental guide now, and you’ll see that we offer waste bins in a variety of shapes and sizes from our 2m3 mini bin right through to our enormous 31m3 bin, which as you can imagine, is BIG enough for the BIGGEST jobs. We aim to give you the best choice in bin hire together with fast delivery, customised hire periods and quick and efficient collection and waste disposal. With Jim’s, you only pay for the time you actually have the bin; unlike some other hire companies, we don’t expect you to pay for set hire periods. Hiring a skip bin is one of the easiest and most convenient ways to dispose of your waste. Whether you have building rubble that needs removing or you need someone to take away your unwanted household goods, we’re the company for the job. We’ll deliver the skip bin you need where you want it, when you want it and then take it way again and dispose of the contents in the correct and safe manner. 2m3 Mini Skip Bin – this size of bin is ideal for most domestic clearance projects, such as house, garden and garage clean-ups and domestic waste. If you want an idea of how much rubbish it can hold, imagine 25 or so large black bags of waste, and you’ll get the picture. 3m3 Midi Skip Bin – equivalent to approximately 30 large bags, our smallest midi skip is perfect for small domestic projects such as small kitchen and bathroom refits, garden waste and DIY projects. 4m3 Midi Skip Bin – if you’re undertaking a larger kitchen or bathroom remodel, you may want to consider a 4m3 capacity skip bin. It’s also a great choice for disposing of large amounts of garden waste or for household clearances. 6m3 Skip Bin – sometimes known as builder’s skips, these larger size bins are suitable for both domestic and commercial use, building projects such as kitchen and bathroom renovations and make ideal receptacles for bulky waste. Our 6m3 bins are also available with drop-down doors. 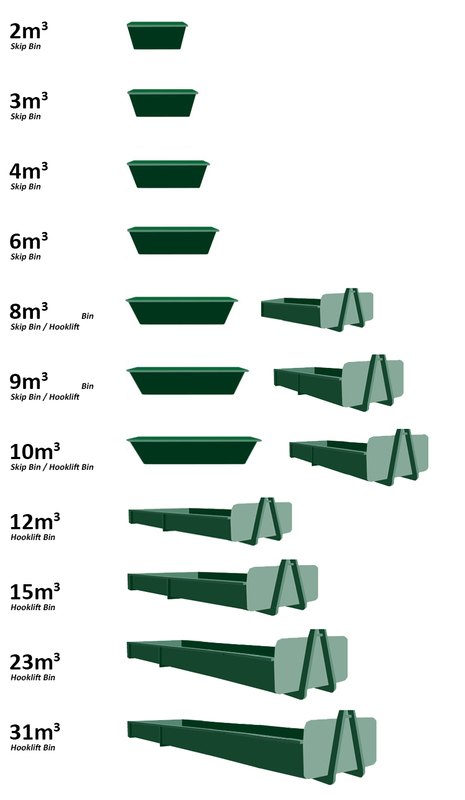 8m3 Skip Bins – as you would expect, the larger the bin, the larger the waste that can be accommodated. These bins are suitable for soil, concrete, builder’s waste and large household or garden clearance projects and are also available with drop-down doors for more convenient access. 9m3 Skip Bins – Perfect for light to medium bulky waste and large household clearance projects. 10m3 Skip Bins – Suitable for light to medium bulky waste items and large household clearance. What Can You Put into Our Skips? It’s a question many people ask. Contrary to popular opinion, you can’t just throw anything into our bins and expect us to dispose of it. There are strict regulations for waste disposal, and while we are able to dispose of most types of waste, there are some types, including hazardous waste that we are unable to accept. Most general household waste, such as white goods, clothes, toys, carpet, wood, boxes and cabinets. Waste from household clean-ups and renovations including concrete, bricks and general waste. Organic waste such as grass clippings, branches and bark, woodchips and fence palings. You’ll also find that you may be limited on the type of waste you can dispose of depending on the type of bin that you hire. If you need further clarification, download our brochure ‘What Can and Can’t Go In’ or contact us on 131 546 for assistance. Hiring one of Jim’s Skip Bins couldn’t be easier. Simply give us a call on 131 546 and speak to one of our team who will be happy to give you a no-obligation quote. Alternatively, simply complete the “book a free quote” form online, and we’ll come back to you with some of the most competitive prices for bin hire in Australia. Once you’ve agreed with the quote and you’re happy to go ahead, we’ll deliver your chosen bin to the desired location. When it’s full, just give us a call, and we’ll come and pick up the bin and take care of the waste correctly. We’re a licenced waste remover, so there’s no need to worry about illegal dumping of waste when you use Jim’s Skip Bins. So, let Jim’s Skip Bins take care of your waste. We’re the best and most competitively priced place to hire skip bins in Australia and with our 100% satisfaction guarantee, you have nothing to lose … except your unwanted waste of course. Why would you go anywhere else? General Waste Most general household waste. Boxes, wood, cabinets, white goods, clothes, toys, carpet etc. Bricks, concrete, soil. Builders / Renovation bins. Waste from household clean-ups & renovations including bricks, concrete & general waste. Green Waste Organic waste such as grass clippings, branches, woodchips and bark, wood, fence palings Any other waste type, or tree stumps.